and group exhibitions at prestigious galleries. Tim David Trillsam manages to excite art lovers and international audiences alike with his signature style. 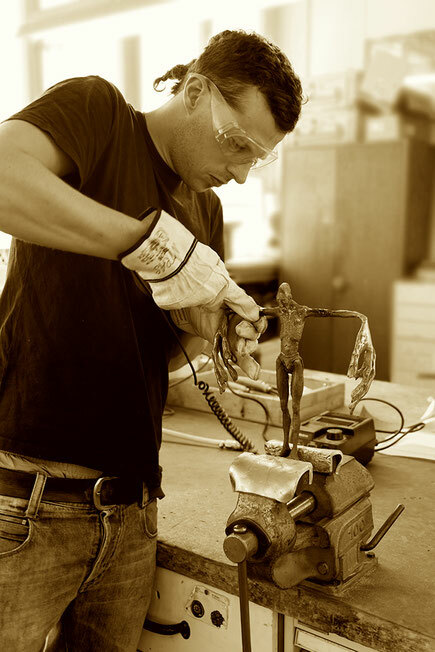 The young sculptor learned his craft at the Berchtesgadener Land Technical College of Wood Carving (Fachschule für Holzbildhauerei im Berchtesgadener Land) and studied at the Academy of Fine Art (Akademie der bildenden Künste) in Stuttgart. Tim David Trillsam’s style is unique and aims at improving the viewer’s eye for minor detail. “In the rush of everyday life in our fast moving society we sometimes forget our surroundings” says Trillsam. With his bronze sculpture „Käfer mit Hirsch“ (Beetle with Stag) for example, he creates a spontaneous encounter with a beetle, in which the human, compared to the insect, takes second row in viewer attention. Trillsam’s figurative bronze sculptures seem bizarre and, in a manner that is remarkable, one feels taken to another world. With wit and humor the artist makes the viewer smile and toys with his self reflection at the same time. A striking feature are the extraordinarily large hands and feet of his human figures, which hold a particular aesthetic for the artist. This way, contrary to the presentation of a perfect human body, Trillsam’s sculptures are reduced to the essential, natural tools of man, thereby contrasting art historical depictions. Another essential element of his bronze works is the raw cast skin. a Figure” as a tool of conveyance. Trillsam does not patinate his works, polishes them sparingly and uses coloration only sporadically. Thus spontaneous traces of the modelling process are largely conserved. Through this special form of surface modelling his sculptures gain a unique liveliness and lightness, which makes the works of this young artist stand out and has made them many a collector’s favorite.